Virtual tours for shops and companies; thanks to Google maps certification we can bring the world to walk in your company or shop thanks to the Street View platform. In fact VisualPro 360 continues where the cars of Google Maps can not go.. reaching the inside of your stores or of your industry. 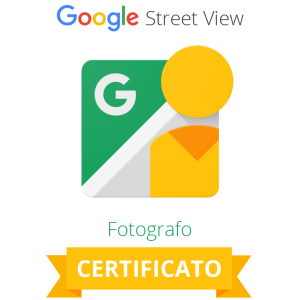 Fabrizio Chyrek was the first google certified photographer of the Modena industrial district and with Visualpro 360 you can have the power and the speed of Google servers for an all new frontier of communication. Thanks to the special plug-in you can put on line or offline not only a virtual tour, but a real new experience, inserting inside the google map tour all those functions that serve to your online communication: the reservation form or the buttons to purchase services-products, all perfectly embedded in your current website or in your facebook page. Contact us or fill out the form to book for a meeting.